We are just a month away from the official announcement of the primo Android smartphone(s). the Galaxy S9(+) While we know what to expect from the Samsung with the Galaxy S9, which is basically a refinement of the gorgeous of the Galaxy S8(+) and then there's the leaked retail box which revealed quite a few details about the Samsung Galaxy S9 specs. If you haven't seen it already, Samsung is keeping the 12MP camera but adding a variable wide aperture, they're also sticking a dual camera system in the Plus version only a la the iPhone. It's also keeping the 4GB RAM, adding a stereo speaker system, IP68, better iris scanner. While all these are good, I can feel that Samsung could've made it great. So here are a few things that I think Samsung should do with the S9. With the push for slimmer bezels on the modern day smartphone, having the fingerprint reader under the display as opposed to the back looks like the only way to go. Considering that placement of the fingerprint sensor on last year's Galaxy S8 was downright ridiculous. While Samsung have been rumored to be working on this tech in the run up to the release of the Galaxy S8 and Note 8. The technology never made it to the final product as it wasn't quite ready for prime time. But as we've seen with the new Vivo X20 Plus UD smartphone, the tech is ready. 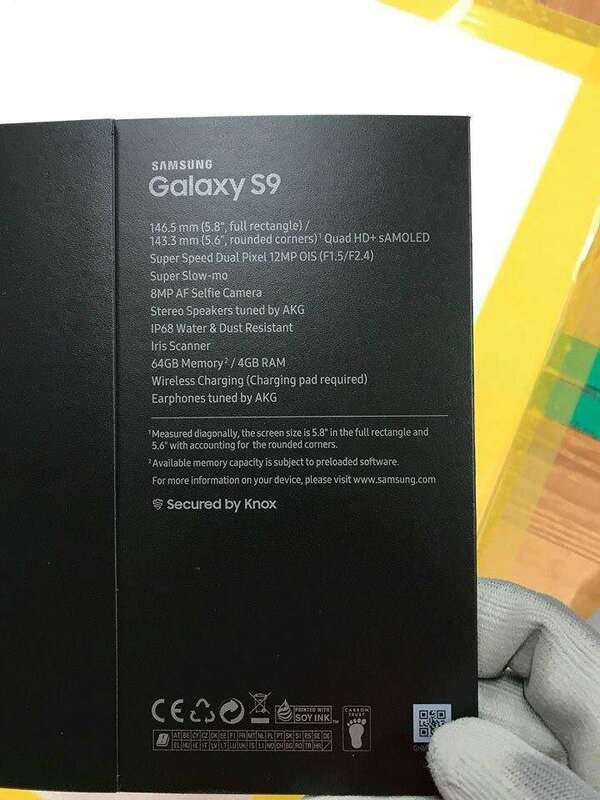 According to the leaked retail box, Samsung is only putting the dual camera setup on the bigger Galaxy S9+ kinda like what Apple does with the iPhone. Gimping the smaller Galaxy S9 is a bad move to me, it's either going to force people towards the Plus model or elsewhere. Some people might argue that smaller size of the Galaxy S9 makes it difficult to do so but then again, the Galaxy S9 is said to be about the same size with the Galaxy S8, which makes it slightly larger than the iPhone X which happens to have a dual camera setup. If Apple can fit two cameras on the iPhone X then surely Samsung can do the same on the Galaxy S9. It's kinda sad to see Samsung still sticking to 4GB RAM on the Galaxy S9 especially when most of its competitors are opting for 6GB to 8GB on theirs even budget Chinese OEMS such as OnePlus, Elephone, Maze, etc. Hell even the Samsung A8 (2018) has got 6GB of RAM. The Galaxy S8 has got some form of facial recognition but it's just terrible especially when compared to FaceID on the iPhone X or even OnePlus 5T. Samsung needs to either get it right or just leave it out entirely and just use the the In-Display Fingerprint sensor. I still haven't wrapped my head why Samsung and other OEMs decided to get rid of the IR remote blaster. It's a really nifty feature which comes in quite handy for me with my Galaxy Note 3. It's feels great knowing that I don't have to hunt for the remote to quickly turn on/off any appliances. And then IR remote blaster is really inexpensive and takes very little space and with the number of gadgets in homes these days, IR blasters should be pretty much standard in every smartphone.